If you ask any San Pedrano where to grab a quick and inexpensive breakfast, the overwhelming majority will tell you to go to Neri’s Tacos. Located on the west end of Tarpon Street, (west of Sancas Plaza) this unassuming taco stand had been a local favorite for years for breakfast and dinner. 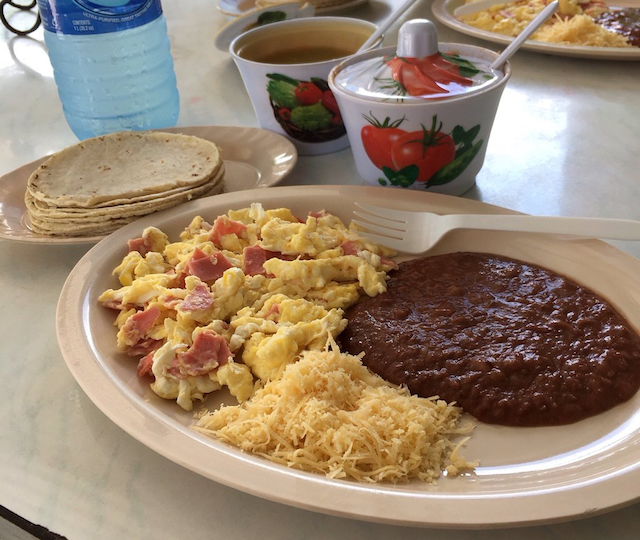 Breakfast favorites range from breakfast tacos with chicken or pork ($1.00 BZD for 3 chicken or 2 pork), giant fry jacks stuffed with a choice of ham, eggs, beans, ($3.00-$5.00 BZD), or the full Belizean breakfast with scrambled eggs with ham, beans, and fry jacks or tortillas for only $6.00 BZD! Dinner choices include fry jacks, burritos ($3.50 BZD), as well as empanadas, and tostadas ($0.50-$1,00 each). Neri’s also has a wide variety of fresh juices including lime, orange, horchata, watermelon, and their famous banana juice. A family of four can easily eat her and leave full for around $10.00 USD. Neri’s is open from 5:30 am to 11:00 am and reopens around 5:30 pm for dinner. Annie’s Pastries is a great spot to pop in for a pre-dinner snack or a Saturday lunch. Annie’s opens mid-afternoon around 3:00 pm, and offers baked treats including jalapeño poppers (our personal favorite), chicken dip, sweet breads, cakes & pies, and the islands best tortilla chips! 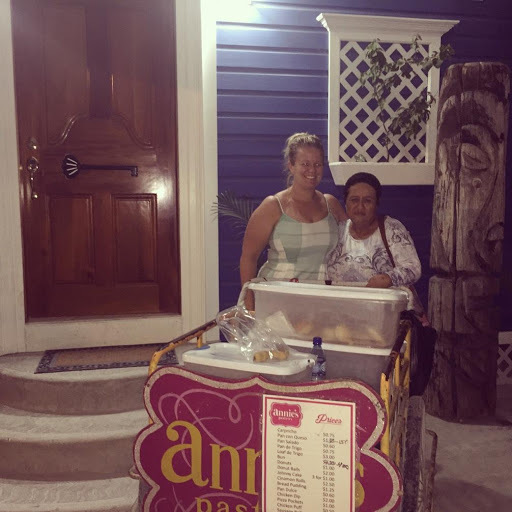 If you can’t make it to their shop just north of the San Juan roundabout, you may just catch one of the Annie’s employees pedaling around on the pastry bicycle-cart. On most Saturdays, Annie’s offers a lunch special that varies from week to week, for between $10.00-$15.00 BZD, but be sure to reserve ahead of time because they often sell out. Sometimes the Annie’s cart will even stop by your office if you’re lucky! 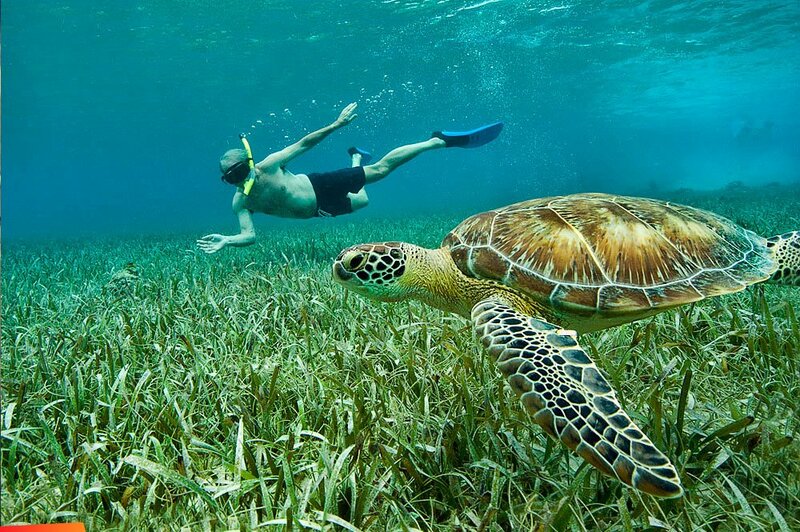 When Belizeans think of the weekend, they think BBQ. Throughout the island, you’ll see BBQs pop up on roadside, beach side, and front yards. While they are all delicious, two of our favorites are Kevin’s BBQ, located South of Grand Baymen on Seagrape Dr., just past SP Hardware. You’ll smell it before you see it, but you can recognize it by the blue tarp “ceiling” and picnic tables. The other is Ramon & Eva’s which is on Ambergris Street between Barrier Reef Dr. and Pescador St (Front and Middle Streets) just to the west of the clock tower at Central Park. BBQ favorites include BBQ chicken, ribs, Italian sausage, and pork chops, served up with either rice and beans, or flour tortilla, stewed beans, and coleslaw. Beware of the chili sauce at Ramon & Eva’s – it is HOT stuff! A plate of BBQ should set you back about $10.00-12.00 BZD depending on the type of protein you get – but it is more than enough food for 2 to share! Briana’s Deli, located on Angel Coral (Back Street) just north of Super Buy, is a local lunch and dinner favorite. Briana’s is my go-to for stew chicken, and I believe they make the best rice & beans anywhere on the island. And all for just for $10.00 BZ. Briana’s offers daily specials including curry chicken, meatballs, and Belizean favorites escabeche (spicy chicken & onion soup) chilmole (black soup) and stewed pigtail. In addition to the specials, Briana’s staples include stew chicken, beef or pork, served with either rice and beans, or white rice with beans, plantain and coleslaw. Most dishes are in the $10.00-$15.00 BZD range and portions are generous! Briana’s is also open for dinner. The menu includes salbutes, burritos, tostadas, garnachas, and fry jacks with stewed chicken and beans. 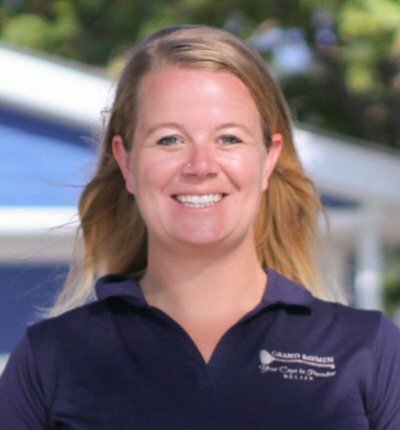 Briana’s is open Monday-Saturday for lunch from 11:30 until they are sold out, and then reopen for dinner at 6:00 pm. Boogie’s Belly is our go-to when we have a craving for meat pies. 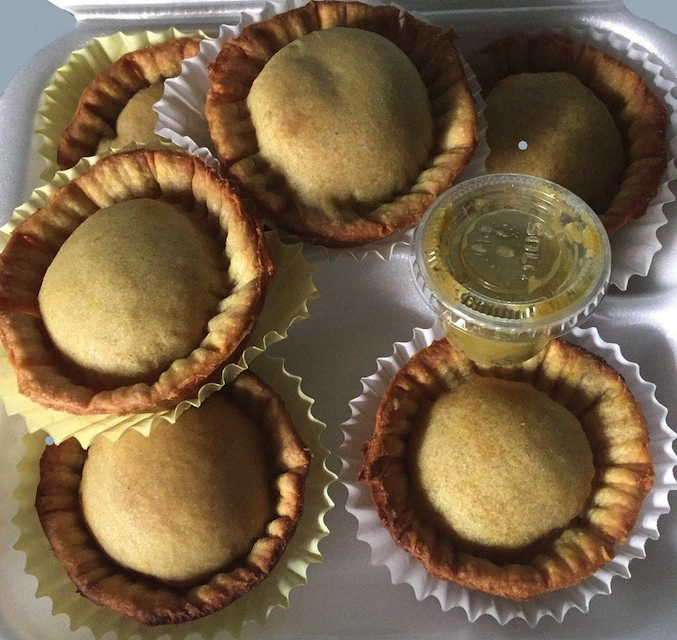 While it may not sound like a breakfast item, these mini hand pies are a Belizean breakfast staple filled with chicken (occasionally lobster when in season) in a spicy sauce. Be careful if they are fresh out of the oven – they are hot! A single meat pie will set you back $1.50 BZD and trust us when we say you’ll want more than one. Boogie’s also serves up breakfast favorites like stuffed fry jacks, burritos, Creole bread, scrambled eggs, and a variety of breakfast meats. Boogies is located on Pelican St. and is open from 6:00-11:00 am Monday through Saturday. Don’t let the outside steer you away – the jerk chicken and seafood here are not to be missed in this family operated restaurant! Aba Isieni, which means “One Love” in Garifuna is a San Pedrano favorite for their jerk chicken, fish or shrimp dishes, as well as other traditional Belizean dishes. Meals are served alongside rice and beans and coleslaw. There are a few small tables if you choose to eat in or grab it to go and enjoy your meal on the tables in the nearby Boca del Rio park. Prices range from $10.00-15.00 BZD and portions are generous for 1 really hungry person or 2 “normal” hungry people. Located on Laguna Dr. just south of the Barry Bowen Bridge on the west side of the street in the green building. 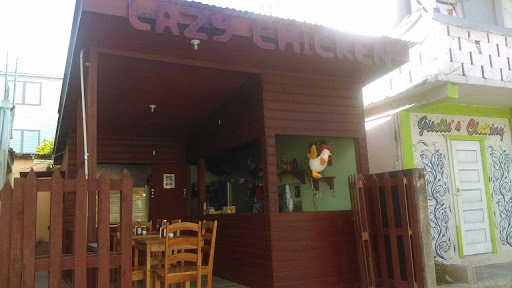 Located on Angel Coral (Back Street) across from Caye Supplies, Lazy Chicken is the place to go if you are craving a simple lunch of roast chicken. This tiny place offers accompaniments including: pasta salad, rice & beans, spicy rice, garden salad, or spaghetti. The chicken is topped with a tasty creamy garlic sauce and is always fresh & juicy. Meals are between $10.00 and $15.00 BZD depending on the type of side that you choose. The Lazy Chicken also offers a “Whole Chicken” deal: for $20.00 BZD you get a whole rotisserie chicken, a side of spicy rice, fresh corn tortillas, and garlic sauce. This spot is only open for lunch and tends to run out around 1:00 pm.